Meanwhile, those who were younger or retired had more free time to spend on activities which promoted their well-being, the researchers suggested. 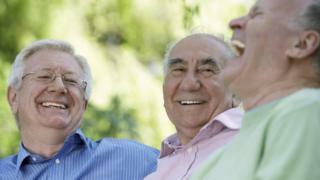 The over-90 age group reported by far the lowest levels of feeling their life was worthwhile, even though their reported levels of happiness and life satisfaction were comparable to those in their 20s and 30s. Understanding how people of different ages rated their personal well-being could help policy makers target issues to improve lives, the study added. "We know that the UK population is ageing. There were more than half a million people aged 90 and over living in the UK in 2014 - almost triple the number 30 years ago," it said. "This shift towards an older population will impact on important policies and services including the labour market, pension provision, and health and social care demand. "Understanding more about how the oldest age groups rate their personal well-being will help focus on issues that are fundamental to a good later life." The "U-shaped" pattern of happiness, which sees people's happiness dip in middle age, has been observed globally. It has been documented in more than 70 countries, in surveys of more than 500,000 people in developing and developed countries, although the age at which happiness is lowest differs between countries. Video Who are the happiest people in the UK?